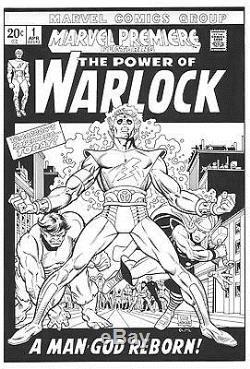 This Warlock cover by Gil Kane has always been one of my favorite Kane covers (and he did a million of'em). The original was inked by the great Dan Adkins. My version was done with india ink on 11x17 bristol, and is in excellent condition. This recreation is by comic book artist, Gary Martin (author of'The Art Of Comic Book Inking'). I use the traditional high quality tools (red sable brushes, and Higgins India ink) NOT felt tip markers or Sharpies. Please check out my other recreations for sale. The item "GIL KANE Marvel Premire Warlock #1 original art Cover Recreation" is in sale since Friday, April 21, 2017. This item is in the category "Collectibles\Comics\Original Comic Art\Interior Pages". The seller is "ink-art" and is located in Vancouver, Washington.